“Treehugger” is a pavilion that is currently exhibited at the National Garden Show (BuGA) 2011 in Koblenz, Germany. It results from a research-project that was initiated by Dipl.-Des. Christoph Krause, director of the Chamber of Skilled Craft’s “Center for Design, Manufacturing and Communication” in Koblenz in 2009. “Treehugger” has been designed by the Department for Digital Design at University of Applied Sciences, Trier, and was led by Prof. Holger Hoffmann in collaboration with his Düsseldorf based office One Fine Day. 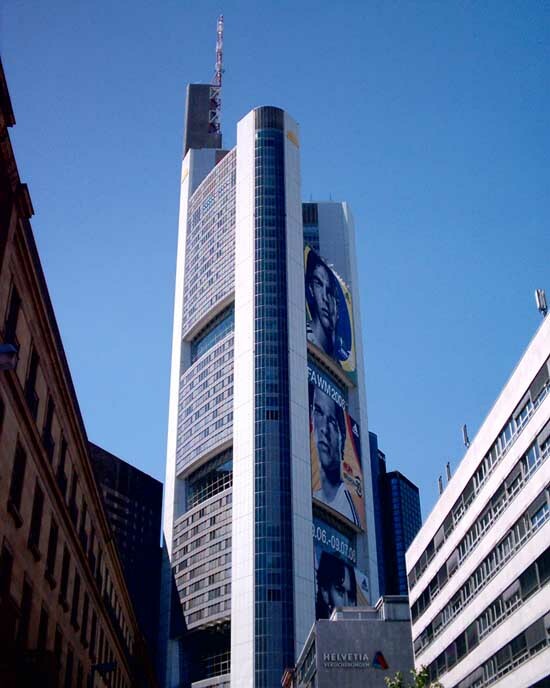 Frankfurt based Office for Structural Design has been responsible for the structural engineering of the project. OCHS Holzbau, Kirchberg, executed the timber/steel-construction. In addition to the project’s mere architectural aspects an integrated interactive light-installation has been developed by the Faculty of Intermedia Design together with the Faculty of Computer Sciences, both from University of Applied Sciences, Trier, as well. The fabrication of “treehugger” has generously been supported by Rhineland-Palatinate’s Ministry of Environment, Forestry and Consumer Protection as well as Signal Iduna and Alwitra roofing systems. Our main aim was to give students as well as craftsmen a broader understanding of recent computational design and computer aided manufacturing technology. During planning and building period this knowledge should ideally be shared between the disciplines in a kind of a “digital mason’s lodge” setting. Thus it is not just the pavilion itself but even more the back and forth of a development-process that we see at the core of our efforts. The city of Koblenz is at the northern endpoint of Germany’s Middle Rhine area which is an important cage of Germany’s Romanticism during 18th/19th Century: during that time’s Romanticism the existing ruins of medieval castles along the Rhine were restored and romantically reinterpreted. The river itself got exaggerated mystically (the fairy tale of Loreley) as well as ideologically (as a “German River”). “Treehugger” is located next to basilica St. Castor in the vicinity of “Deutsches Eck” on a plot that has previously been used as a parking lot. Here, the pavilion is situated at a pivotal position in between the Gardening Show and the surrounding urban fabric. It will perform as a platform for diverse events during summer 2011. In October 2011 “treehugger” will be dismantled to then be re-erected on the premises of the Chamber of Skilled Crafts, Koblenz. “treehugger” has to serve as a place for exhibitions, lectures, workshops and similar events. Thus a circuit, a one-directional space and a row of cubicles had to be implemented within in one spatial configuration – which normally results in a claim for flexibility that would then be answered with as little spatial or structural determination as possible. In this case however we have decided to rather blend the three main programs. By rotating one structural element (the tree-like columns) around a pivot in the center of the pavilion different regions of possible action emerge. This fairly simple geometrical operation then allows for all three conditions to take place at the same time: the exhibition pieces of the circuit are shielded by the tree-like columns that again create in between cubicles for work-stations in a workshop scenario. Lectures take place in a “Totaltheater”-like central space. During eighteenth and nineteenth century pavilions were laid as “follies” into a picturesque landscape. They were explicitly designed to motivate and foster fantasies by creating places of a specific ambience that is different to its context. Out of this tradition pavilions did not necessarily have to affiliate with a specific built environment – on the contrary. Often a very specific moment of tension unfolds from a pavilion’s formal or atmospheric discreteness or even its opposition to a given context. For sustainability reasons “treehugger” will not only be erected once and then disappear, but it will be relocated in October 2011. Therefore the decomposability of the timber-structure has been of great importance from the beginning of the project. We have decided to use materials accordingly and thus avoided the sexiness of digital modernism’s white surfaces in favor of a much more tectonic appearance. Due to its peculiar location the pavilion should formulate a subtle link to Romanticism’s enthusiasm for the mystique, the fantastic, and the transcendental. So it is a rather anticlassical “un-clear”, “as well as”, “all at once” approach that drives the structural, formal, material and spatial configuration of “treehugger”. Therefore we have designed the pavilion in the shape of an extruded pentagon instead of a square-box – a simple geometrical “plus” that changes the building’s appearance significantly in relation to a beholder’s standpoint. The partly screen printed glass curtain blurs the interior construction and superimposes reflections of the surrounding trees. The polygonal geometry and manifold symmetries of nearby St. Castor’s stellar vault have been a major inspiration for the project. Together with a rotationally symmetrical order a system of interdependent geometrical relations was defined that was resilient, yet rigorous enough to adapt to specific structural and functional needs. Furthermore the “branching” and inherent porosity of the trees’ leafy canopy above has been abstracted into the similarly “porous” pentagonal and rhombic tessellation of the surfaces. A merely haptic space of structural ornaments during the day, “treehugger” changes entirely at night time. Then the interactive light-installation reacts to the visitor’s movements and literally virtualizes the space and its structure. In conjunction with the initial research project we have conceived, designed and constructed “treehugger” entirely with the help of recent computer modeling software and programming language (a.o. Rhinoceros 4.0, Grasshopper, Visual Basic/Rhinoscript) – this mainly to find an efficient balance of technologically advanced as well as common low tech production methods. Thus the timber-works have mainly been factory machined by an automatic cutting machine that is normally used for standard timber roof structures. All steel knots have been lasercut and then been assembled with the tailored woodworks to mid-size prefabricated components.